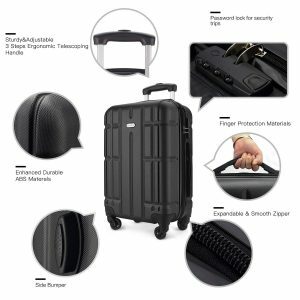 ShowKoo Luggage Set includes three expandable spinner hard-shell suitcases with a sturdy and durable ABS plastic exterior that also happens to be lightweight. 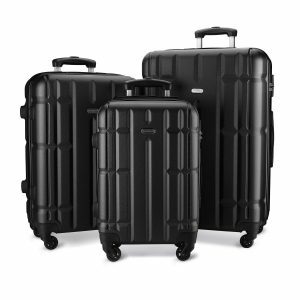 The set of 20”, 24” and 28” suitcases is offered in four different color options of black, dark blue, silver and dark gray at the same affordable price. The robust and lightweight solid ABS exterior is both impact and scratch resistant. You can use them on your frequent travels for leisure and business purposes and they will still stay the same as the first day. You may roll the bags smoothly on their solid black single spinner wheels by holding the three-step push-button telescoping handles with an ergonomic design. These black wheels have a unique design and more solid structure and move in all directions- 360 degrees effortlessly and quietly, giving you the ability to maneuver even in very small spaces. You have the fully lined polyester interior with a large mesh pocket on the left, the elastic straps on the right and the zippered divider in the middle for better organization of your clothes and other items. Each bag has a three-digit side-mounted combo lock for both your privacy and security. And you’re advised to change the 0-0-0 combination to a password you shall remember easily. You’ll find two reinforcement brackets on the flip side of the side and top handles, so any cracking on the exterior shell is avoided. And you’ll feel more comfortable when lifting heavy luggage thanks to the soft rubbers on handles (TPU finger protective materials). The 20” carry-on bag measures 15.4 x 8.7 x 22.4 inches, the 24” medium suitcase measures 17.3 x 9.8 x 26.4 inches and the largest 28” is 20.5 x 11 x 30.3 inches. You can use the smallest one as cabin bag and take with you onto the plane. But you need to check in the 24 and 28-inch bags before your flight. You’ll get the small fitted into the medium and the medium into the large suitcase. This Showkoo Luggage Set goes through several luggage quality tests (like the luggage bearing test up to 75kg) before going out on the market. It is offered with a warranty of three years by the manufacturer. And you may contact their customer support in case you run into any problems during the purchasing or after-sale. You can do this on Facebook by messaging Showkoo Direct or via Amazon messaging service. It is a decent value luggage set with a sturdy construction, ergonomic design, spacious interiors and user-friendly features at a reasonable price.